On Eva: Pink Chicken dress, $74, City Sprouts; Uggs, $120, Nordstrom. On Amy: Rachel Zoe sweater, $275, Vie; Equipment blouse, $208, Vie; Lululemon leggings, $98, LuluLemon; Franco Sarto boots, $189, Macy’s; Earrings, Never Enough. On Dimitri: Shirt, Dimitri's own; Joe’s jeans, $59, Nordstrom; Converse, $40, Laurie’s. On Yanni: Barbor vest, $219, Outdoors; Barbor shirt, $99, Outdoors; Jeans, Yanni's own; Shoes, Yanni's own. On Amy: Lorna Jane jacket, $159; pants, $99, Dimvaloo; Shoes, Amy's own. On Yanni: Zobha shirt, $65; pant, $95, Dimvaloo. On Dimitri: Lacoste pullover, $55, Nordstrom; Joe’s jeans, $59, Nordstrom; Converse, $40, Laurie’s Shoes. On Eva: Tea sweater, $69; t-shirt, $25; pants, $39; City Sprouts; Uggs, $120, Nordstrom. On Eva: Egg vest, $70, shirt, $44, leggings, $29, Dandelions; Uggs, $120, Nordstrom. On Yanni: Barbor jacket, $379, Outdoors; Jeans, Yanni's own; Shoes, Yanni's own. On Dimitri: Johnny O polo, $48, Dandelions; North face fleece, $99, Nordstrom; Joe’s jeans, $59, Nordstrom; Converse, $40, Laurie’s. On Amy: Vest, $67, Never Enough; JBrand jeans, $214, Vie; Franco Sarto boots, $189, Macy’s. Laumeier Sculpture Park is one of St. Louis’ most spectacular gems. Set on more than 100 acres, Laumeier is home to large-scale sculptures, interactive works of art, hiking trails and more. It also hosts a variety of exhibits, educational programs and family-friendly entertainment and events year-round. 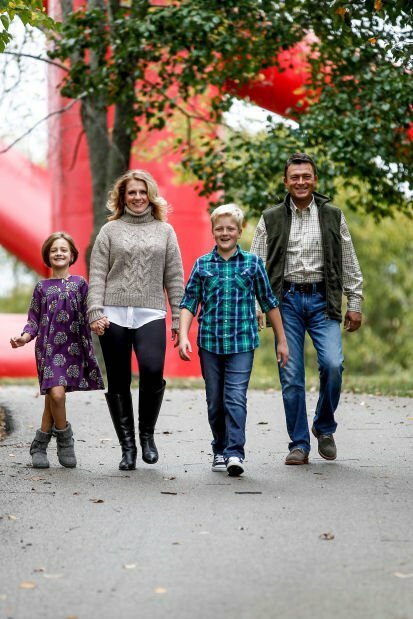 The Loli family of St. Louis picked a perfect fall day to explore and enjoy the sights, all while showing off some very stylish and playful looks.